Geoffrey Dyer won last year’s Archibald Prize with a portrait of acclaimed author Richard Flanagan. Predominantly a landscape artist, Dyer paints a portrait each year for the Archibald and likes to choose fellow Tasmanians as his subject. Previous subjects have included John Clark, director of NIDA, and Gallipoli veteran Alec Campbell. Graeme Murphy, another Tasmanian, is the co-founder and artistic director of the Sydney Dance Company. A prolific choreographer, Murphy was awarded an AM for services to dance in 1982. In 2001 he won the Helpmann Award for Best Choreography for Body of work, a retrospective and the following year was honoured with the prestigious James Cassius Award in recognition of his career achievements. In 2003 he was awarded the Australian government’s Centenary Medal for services to the development of dance in Australia. Born in Hobart in 1947, Dyer studied at the Tasmanian School of Art. He has exhibited regularly at galleries around Australia since 1970. He was part of Out of Australia, a group show seen in Shanghai in 1998, and Out of Australia 2000 in Hong Kong. Last year he exhibited in five art shows besides the Archibald: the 16th Annual Summer Show at Despard Gallery in Hobart; SOFA Chicago (Sculpture, Objects and Functional Art); Painting: Tasmanian landscape at Plimsoll Gallery in Hobart; at AXIA Modern Art in Melbourne; and at the Wagner Art Gallery in Sydney. 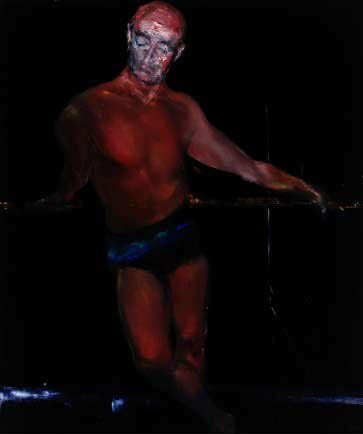 He has been in the Archibald Prize on seven previous occasions, in the Wynne Prize eight times and was a finalist in the 1997 Sulman Prize. His work is represented in many public and private collections in Australia and overseas.